Photo courtesy of Jasmine Sallay Carrington. 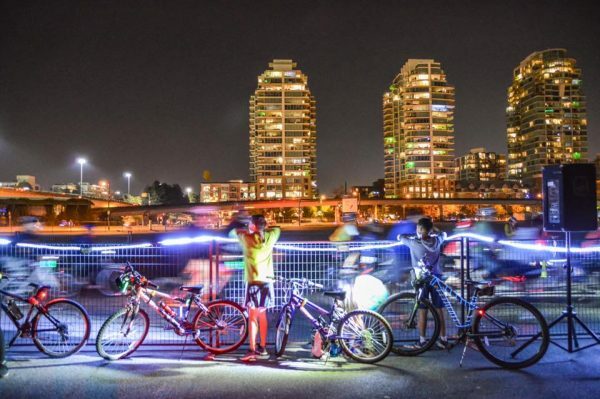 HUB Cycling is organizing BC’s only fully permitted, open streets night ride again on Saturday, September 15, 2018. “The combination of music, costumes, bikes, glowing lights, and thousands of other people creates a very unique community experience,” says adds Wilkins. “Many cities have been hosting mass bike ride events like this for decades because they’re a lot of fun – and because they encourage people to get their bikes out of the garage.” Bike the Night is modelled after Montreal’s hugely popular ‘Tour La Nuit’, which is organized by Vélo Québec and after two decades now gets over 15,000 participants each year. HUB Cycling surveys show that people who participate in Bike the Night end up using their bikes more frequently after the event. HUB Cycling expects that more than 5000 people, including over 500 children, will participate this year. “Bike the Night was one of the best experiences we have shared together as a family,” said one 2017 Bike the Night participant. Bike the Night will kick off on September 15th at 6pm with a pre-party featuring free snacks, bike repairs and giveaways for registered participants. The easy 10 kilometre route will start at Concord Pacific Place (corner of Carrall St. and Pacific) and wind through some of Vancouver’s most iconic streets including a car-free Burrard Bridge. Thousands of people of all ages and abilities are expected to sign up for the ride and are encouraged to decorate their bikes with lights and come in costume. While the ride is mostly getting people on bikes, building community and helping Vancouver become an even “more fun city”, it also helps to improve safety. In 2017, thousands of free lights were also given away to participants to encourage safe riding after the event. Based on the findings from our surveys, 70% of participants reported that they use lights while riding at night, a 10% increase from before the ride. Registration is only $15 until September 1st and includes access to the ride, one entry to win a grand prize from MEC and other great prizes, and an admission to the kick-off party with live music, free bike tune-ups and decorating, relay races, free snacks, giveaways and entertainment. Youth 16 and under are free. Everyone who signs up at www.bikethenight.ca before July 31st will also be entered to win a Pannier form Two Wheel Gear. HUB Cycling is a charitable non¬profit that has spent two decades removing barriers to cycling in Metro Vancouver, while cultivating the health, environmental, and economic benefits that active transportation can bring. HUB Cycling has educated thousands of people, motivated thousands more, and championed improvements that benefit current and future cyclists. HUB Cycling’s mission is to get more people cycling more often. For more information, visit bikehub.ca.